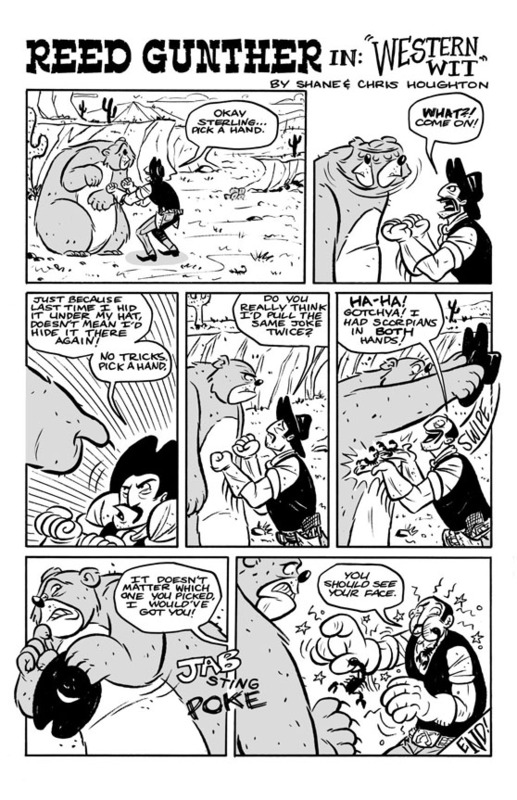 Western Wit appears in the back of issue #4, Reed Gunther in Fish Out of Slaughter! The long stories are better. But you could use the one page ones as backup when you can’t get the main story up. Or simply between the regular updates. I love the one page stuff, I think you should upload a weekly one online. Thanks for the great feedback guys! We’re hard at work trying to get some more Reed Gunther content out there for ya! Jeebus! I saw the last panel coming but it was still horrifyingly hilarious. Great page! I just wanted to stop by and say congrats on the Image deal. I saw you two at LBCC, you’re both rad an deserve it. Hope it lead to even bigger thigs. Gotta say I loved the comics I bought there too! I was already familiar with your work from having bought issue #4 in the original b/w edition (bought for obvious reasons) and enjoyed it enough to kep an eye out for the new Image editions after hearing that you guys had made a deal with them to republish the earlier material. Wishing you the best because the comic industry needs more good creator owned all-age comics like Reed Gunther and hopefully Image will give Reed and Sterling a great new place to call home and where lots of readers will find them. Thanks Steve! We’re thrilled to be coming out in color through Image and we’re happy you came back to check it out! Hopefully folks will continue to discover our little book. 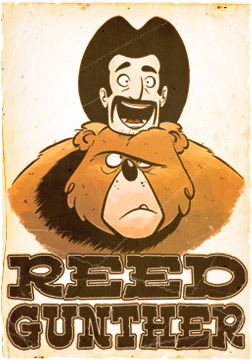 As long as folks are reading them, we’re more than happy to keep making fun and goofy bear-riding cowboy adventures!